I just found out about this fantastic deal for a collection of game books and I knew that it needed to be shared! Humble Bundle is an online shop that provides collections of video games, and sometimes books, that are available for a limited-time only. The buyer is able to CHOOSE THE PRICE and support a charity in the process! Humble Bundles are typically popular for a unique gathering of games and the pay-what-you-want model allows for bonuses when the average payment is exceeded. Humble Bundles are popular for a unique gathering of games and the pay-what-you-want model allows for bonuses when the average payment is exceeded. There are also plans for extra books if they sell beyond a certain number! You can pay with Paypal, credit card, Amazon or even Bitcoin. 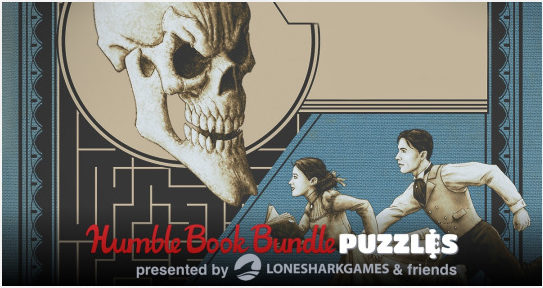 This Book Bundle, called the Humble Book Bundle Puzzles is presented by Lone Shark Games a game & event design studio out of Seattle. They create physical games, using cards and board games. 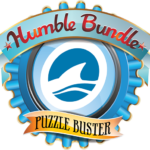 The Game Books found in this Humble Bundle include puzzles using logic, wordplay, numbers/math, crosswords and lots more. The products are all digital and as soon as you make your payment, you’ll get a link to download the game books. They can be downloaded directly to your ebook reader, or to your computer as needed! Pay $1 or More = 6 Books + 1 Bonus Book to be announced! Pay More Than $7 = Previous Books + 7 Books + 1 Bonus Book to be announced! Pay $15 or More = All Previous Books + 7 Books + 1 Bonus Book to be announced! I definitely recommend you check out this deal, and it is available for the next 2 weeks so you have time! For all of you puzzlers out there, there’s also a small puzzle located in the bundle description. If you find the answer, you get a lovely little icon just like this.